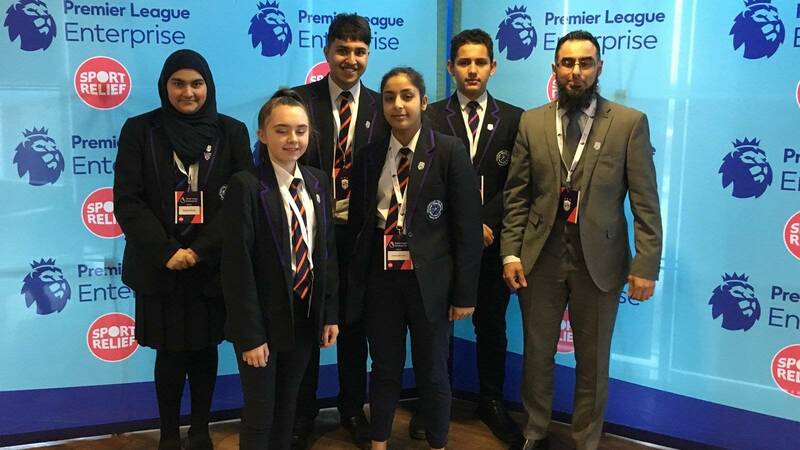 Westborough High School represented Huddersfield Town in the Play-Offs of the Premier League’s Enterprise Challenge at the King Power Stadium on Tuesday 16 January 2018. The pupils competed against representative schools from Derby County, Norwich, Middlesbrough and Aston Villa, who all pitched ideas on how to make their home stadiums more inclusive to a panel of judges. The five Westborough students – Ahmed Etorki, Nayab Mirza, Usman Qaisar, Hafsa Ahmad, Natasha West – progressed to this stage after impressing Huddersfield Town Chairman Dean Hoyle with their ideas of a Community Fan Hub and Inclusivity App to help promote inclusion within the John Smith’s Stadium, whilst also working out a financial forecast predicting the returns Town could get from incorporating their ideas. The Westborough High School pupils attended the Play-Off with support from the Town Foundation team and Trustees Janet Hoyle, Caroline Lee and Stuart Bragan. Each group made up of Year 8, 9 and 10 students had to pitch their ideas and presentations to a panal of judges that included representation from the Premier League, Stonewall, Sport Relief and Leicester City, whilst making sure their ideas fit in line with the Premier League Equality Standard. The event was hosted by Kim Inglis, a TV presenter and Journalist, and the students also took part in a Future Skills Workshop delivered by careers company, EY after they presented their ideas. Unfortunately, it was a very strong heat, and our congratulations must go to Freebrough Academy, representing Middlesbrough Football Club who were selected by the judges as the winners. Town’s representatives Westborough High school received some very impressive feedback from the judges, who commended their level of research, costings, marketing materials and professionalism. 31 clubs across the Premier League and EFL entered this year’s Enterprise Challenge and have competed across six Play-Off events. “The pupils from Westborough High School were outstanding throughout the day and all five have been on an incredible journey over the past few months. “On the first day of Enterprise they were very shy and reserved, they hadn’t worked with each other before and hadn’t worked with their teacher Mr Patel before.